perfect event entertainment for science & technology conferences and expos or have sci-fi or futuristic event entertainers. Prepare to be dazzled by Electra Android; a glittering, towering stilt robot at 4 metres in height! Electra is an elegant, silver spectacle who explores events with her Inventor. Children adore Electra and beg to use her remote control! Electra Android is one of the best stilt walking acts in Melbourne. She is perfect event entertainment for science, technology, future and science fiction themed events. A Robot everyone will remember. Electra Android is a towering 4 metre tall stilt spectacle! Electra Android is just complicated enough to have some people believe she is a real robot! Electra Android is a unique stilt performance. Coming soon... Tubby the robot! 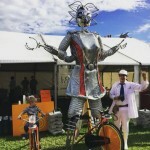 Stilt Walkers Australia supply future science and technology themed entertainers for any sci-fi related event.